When I hear Jaeger, I automatically think of Red-Headed Sluts and Jaeger Bombs. I’ve never had the latter, and probably won’t ever, thanks to the former. I have a love-hate relationship with the Sluts. Word to the Wise: A fifth of Jaeger in one evening will do that to a person. Hey, You’re only young once, right? Even if that was when you were thirty-two years old, right? I’m so glad that I didn’t have to work on renewing my JaegerMeister relationship this weekend. I happen to have a generous co-worker that supplied me with my first opportunity to experience venison sometime in the fall. I used up the first round that he shared with me, a couple months ago, and mentioned to him that I wouldn’t be opposed to more. He was more than happy to share with me again. Even my kids were excited with the news (I have to say that I’m thankful for kids that trying new things, more than the average). I researched some new recipes and found an amazing site that catered to wild game recipes. Thanks to Hank Shaw, I found an amazing recipe: Classic Jaeger Schnitzel. As a child, I remember hating mushrooms and onions and I’m really glad that I grew up (well, only grew up partially). This recipe called for 1-1 1/2 pounds of mushrooms. I used a pound of white mushrooms because that’s what I have the most of, on hand. I was a bit skeptical about throwing them in a hot pan without any sort of grease but the recipe told me to and who’s to argue with a recipe? I won’t argue that the smell was so amazingly, intoxicating–even more so when I added the Bacon grease and a whole, chopped onion. As soon as those were browned, I transferred them to a bowl and added more Bacon grease to the pan (no…..this isn’t a heart attack waiting to happen….at all!). I then dredged a pound of backstrap strip cutlets in flour and seared them for about ninety seconds on each side. The best part: The part where I make a gravy with stock, heavy cream and more Bacon grease. 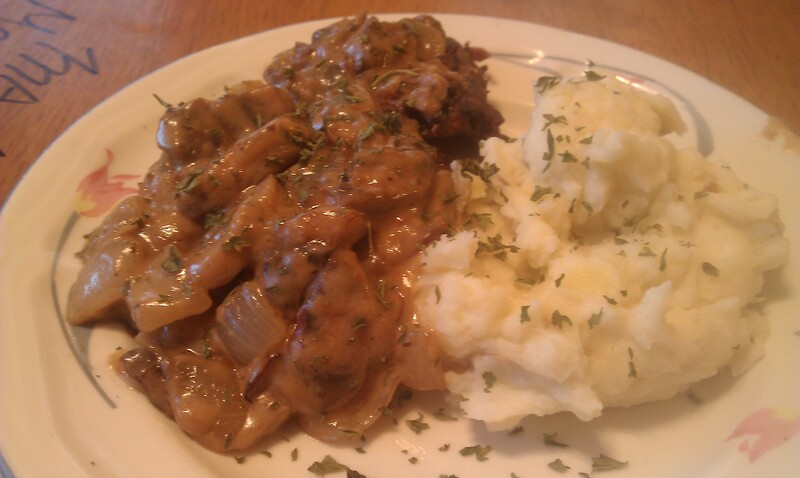 I threw the mushrooms and onions back into this amazing, creamy concoction and served it aside some light garlic mashed potatoes. The first time I made venison strip cutlets, I literally gagged. I don’t like the “gamey” taste as much as my partner does but this recipe left me in absolute culinary bliss. And in complete opposition to the author’s description of this mean being “a manly meal, and the only green thing allowed is, occasionally, parsley”, I made a green salad to go along with it. I received no complaints. This entry was posted in food and tagged venison. Time to make the doughnuts…..